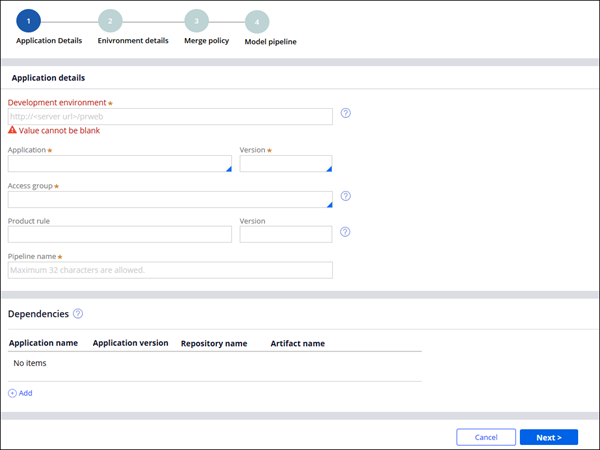 Deployment Manager 3.2.x and later now provides a new, intuitive wizard when you add a pipeline either on premises or on Pega Cloud. The wizard guides you through and simplifies pipeline configuration so that you can quickly add and set up your pipelines. Additionally, if you are using Pega Cloud, Deployment Manager automatically detects the URLs of all your candidate systems, so that you do not need to configure them. Also, when you install Deployment Manager on premises, default operators and authentication profiles are shipped with the application, which further simplifies and speeds up installation. For more information, see Installing, upgrading, and configuring Deployment Manager 4.1.x.